When you're having fun!! It's not that I've been having so much fun but I sure haven't taken the time to blog! The year end reports and tax forms took precedence and since I have those things all in the mail, I can get back to the fun stuff! I do want to show you another of the purses from the November class that I taught here in my home studio. Susan stopped by to pick up a stand for her frame, week before last and brought her finished project along!! She did a great job and uses hers as a tote bag! I love to see their end results! This is a close-up of Susan's work ~ you can see her needle felted flowers and proddy sunflower and her very nice appliqued pumpkin. Take notice of the hill that we used to ground the pumpkin ~ the little orange circles are quilling or what I call 'cats' paws'. It's interesting that in Maria Barton's blog and Kris Miller's latest blog post, they both are doing the cats' paws as part of a sheep's body! I learned it in a Kindred Spirits class a couple of years ago. It's just a little different way to use your wool strips to give some interest to a particular spot that could use a little jazzing up ~ like this hill ~ it would have been kind of dead but the cats' paws give your eye a place to land. Many of you know how to do them, I'm sure, but for those who want a little tutorial, I ran downstairs and put one together quickly. You can use all one color, two contrasting colors or several, if you choose. Put the strips together and wind into a circle ~ when you get the desired size, run thread back and forth across the circle to hold it together, making sure to fasten the strip ends and then tack it to your foundation fabric at the place where you want it. You can also shape your circle into a diamond shape or a square or even a heart shape. Hook right up around your cats' paw and voila! Something new to try! On one of rug hooking forums, on the photo page, there were pins made out of cats' paws. A shot of frozen Lake Erie, for all of you who are somewhere warm where the sun shines!! This was last weekend and nothing much has changed. It's been REALLY cold this week ~ 18 degrees right now at 3 in the afternoon! Stay warm wherever you are!! Done by my little grandpeople!! Over the holidays, the Seattle grandchildren wanted to hook and I was very happy to have that happen. Haylee, who is 11, started this hooking this heart FOUR years ago when they were here at Christmas! Two years ago (they come every other Christmas), she worked on it about 5 minutes and was done! This year, the day they left, she decided she would finish her heart! They do the motif and I hook the background and finish it and will send them on their way! Hunter, on that last day, decided he wanted to hook! This star was started by grandson, Luke, in '08 and didn't make much progress so I told Hunter to have at it!! When Luke figures out this is his star, I'm guessing I'll have some 'splainin' to do, but I had no time to draw something new!! I really think they do a nice job for beginners ~ it's fun having them share my artistic interests! Eight year old Hannah is the one who would really be my hooking buddy if she lived nearby ~ she did a great job on this fish and spent a lot of time in the hooking room over the holidays! I copied the fish from a painting that older sister, Haylee, had done last year and Hannah picked her own colors. I love this little mat ~ Hannah wants to give it to Haylee for her birthday in March ~ isn't that sweet? I did hook the head and eye for her but she did all the body and fins and really worked hard at it. Next time, I'm going to draw on linen as she really struggled with the threads that make up the monks cloth. Two years ago, she hooked a star and did just a grand job for a 6 year old. I'll label each of them with all the details and hopefully, they'll have them through the years and remember hooking with their Bobo! Since I last posted, I've covered a lot of ground! Friday morning, I drove to Columbus to the Heritage wholesale market ~ didn't find a lot but did get a nice piece of paisley! My friend, Vivian, went along and we did a little shopping and had a nice lunch ~ she made me promise we'd go to lunch!!! 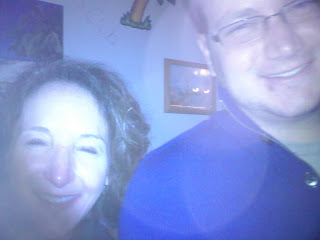 Friday night, we went to a party at our friend Rita's ~ a shared birthday party for Sonny and our friend, Ken. Saturday morning, I drove to Columbus for a different wholesale market ~ again, not too much there for me but the January shows are smaller. I like to add pieces of folk art to my booth to have something that appeals to those that aren't into rug hooking ~ I'm sure I'll find some things at the March shows!! I met Sonny for lunch on the way home ~ he was at the tool show in Columbus that morning. That night, we had his six brothers and their wives for our annual get together ~ kind of a brothers' bonding time! I started pork and sauerkraut on Friday since I was going to be gone most of the day on Saturday, with the thought that it could finish cooking after we got home. Sonny boy put it in the oven at 2:30 and when I got home, it didn't look like it would be ready by 6 ~ so I jacked up the over to 500 degrees ~ I love to cook on high and hot! By 5:30 things weren't looking a lot better and the kitchen was hotter than Hades ~ so I ran to Subway and bought some subs to feed them until the pork was ready!! As it was, we didn't eat till 7:30 as some of them came later ~ I had taken the lid off the pan so the juices would cook down ~ therefore the pork roast was harder than a hockey puck on top - one of the brothers said he thought he was gonna break a tooth!! What a fiasco!! In the end, it actually was all very good ~ the subs, too ~ but it about made me crazy!! The sister-in-laws all bring food and for a while I thought it was pork and pies ~ we had at least 6 of them ~ all yummy! In the midst of all that, Sonny found our freezer in the basement unthawing ~ that was a nice topper to the day! So, he bought a new freezer on Sunday (I stayed out of it!). He decided to clean the coffee pot when he got home ~ it was running too slow ~ that worked out swell ~ after he was finished the damn thing didn't work at all!!!!!!!! Yesterday, I bought a new coffee pot ~ wonder what else is getting ready to roll over and play dead!!! I hope it's not me! Last night we went to a 5th grade band concert ~ Luke & Jakob were playing the saxophone and trumpet. It was really pretty good ~ it's amazing what these kids learn in a few short months ~ we get to go to another one in April! And believe it or not, I went back to Columbus today to the car dealership and squeezed in a trip to Whole Foods ~ I love that store!!! I brought home lots of good things to feast on! Tomorrow I'm home all day ~ thank goodness ~ and then to the lake for the weekend to celebrate the old guy's birthday!! Ta ta for now ~ hope you're having a good week! Just to give you an idea what our Christmas gathering looks like!! This isn't quite everybody ~ son, Brian, isn't in the room ~ grandson, Cam, is behind someone ~ grandson, Nick, and family didn't come till evening (they had so many places to be that day) and I'm behind the camera! We also had an early morning Christmas with Chris's family since Santa found them all the way here in Ohio ~ that was fun! ~ even down to carrots on the deck for the reindeer and milk and cookies for Santa! Little great granddaughter, Blakleigh, is really cute! She's one and a half ~ her little brother was sleeping somewhere while somebody captured her in my office sitting with this bear! The little kids really do a great job of entertaining her! Haylee is modeling the purse I made her on Saturday before they left ~ she asked if I could get one done for her to take home ~ sure! It's from a felted sweater with horses ~ and the handle is from another one that had lots of metallic in it ~ I lined it with a couple of different cotton fabrics and she was happy as a clam! They left about 4 in the afternoon and it was so sad ~ I cried big crocodile tears ~ the kids are so fun and so well behaved ~ we hooked and played cards and Grandpa made them fried mush and homemade pancakes and we went to Amish country one day to see their great aunt. Hannah, who is eight, felt bad for the Amish not having electric or phones ~ she said "why don't they move into town so they have all that stuff"! We went to a cheese factory and an Amish restaurant. It was a hectic ten days (a lot went on besides all of the above) and I'm just now coming back to life ~ but they'll be back this summer for Chris's class reunion!! One more Christmas factoid and then I'm done! For Christmas dinner, Seattle son, Chris,had a Tur-duck-en sent to us! Never heard of it? Neither had we!!! It was very tasty ~ now I'll tell you what it is!! A turkey stuffed with a duck stuffed with a chicken stuffed with cajun rice and shrimp stuffing!!!!!!! Imagine!! I lifted this little teeny picture from the web so you could get an idea ~ the highlight of our Christmas feast!! Off to spruce up my hooking room ~ I have a couple of gals coming later and right now, it's not a pretty sight!! It's warming here in Ohio ~ 40 degrees today!!!! And sunshine!!! Yay!!! I hope the sun is shining on you wherever your are! Was one of the things we celebrated over the holidays! Tad is my oldest son, 45, who lives with us and as I've mentioned, has Down's Syndrome. Even though his birthday is 3 days after Christmas, he always wants "the whole gang" as he calls us, to get together so off to a local restaurant we went ~ all 25 of us!! Here he is with 9 of the grandkids ~ the oldest, Nick, wasn't there yet! I had to include this picture (even thought it's grainy) because it appears that a couple of the kids are praying while Tad blew out his candles!! We're a very spiritual group, you know!! And this picture was cute to me for two reasons ~ because the grandpeople decorated themselves with the tissue paper from Tad's gifts (creative bunch that they are ~ they decorated great-granddaughter, Blakleigh as well!) and because Tad was so happy to be there in the midst of all these kids. As they get older, he enjoys them a lot more and all the little kids love their Uncle Tad a lot. Here we are back at the house ~ Tad, Sonny, Miki (Ted's wife), Seattle son - Chris, Mama, Ted, and Korinna, Sonny's daughter ~ don't know where the rest were at that moment. I love this picture because, again, Tad was just so happy ~ he had a great holiday season with his family ~ and that means a lot this mother! I'm coming out of my holiday exhaustion and am able to function again!!! 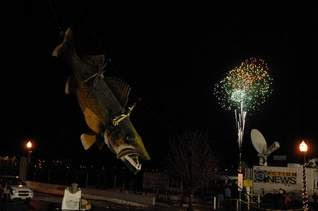 This is how we spent New Years Eve ~ in Port Clinton ~ watching the infamous Walleye Drop!! Actually, I lifted this photo from the newspaper archives (mine was with my phone and toooo blurry)! It wasn't really cold as it has been other years and was quite fun hanging out in the street waiting for midnight with our friends! We started out the evening at our friends' condos for appetizers and then went to dinner in town and then to Kokomo Bay! And in Kokomo Bay, we met this very adventurous girl, Lisa from Atlanta! I took a photo, again with my phone (sorry) of Lisa and Brian, our friends' son, who came to join us from Chicago!! See how much fun we are ~ they come from far and wide to hang out with us!! Lisa googled New Years Eve and chose between P.C. and Key West!! I told her she should have called me ~ I would have given her some advice!! She was very fun ~ and I'm so impressed that she drove up here alone ~ she even made the newspaper! And then she commented on my New Years Day post and said we made her New Years!!! Imagine that!! 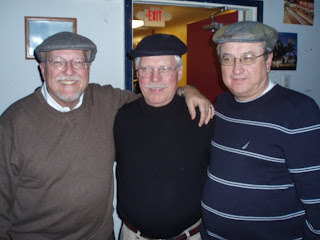 This lovely trio, I have titled "old guys in hats"!!!!!!!! We had a great laugh over this ~ Bill, Sonny & John all have these nice caps and coincidentally, all wore them ~ it was too good not to capture for posterity!! Actually, a cap like that brings fond memories to mind for me ~ my dad died when I was a little girl and he always wore a cap like that ~ I'm kind of drawn to an old guy in a hat, especially the one in the middle! My Seattle kids were home for 10 days and it was a whirlwind of activity the whole time! When they left on the 2nd, I took to my bed and I've just kept a slow pace since then! Last night we went out to the little art gallery in Mansfield and out for a little dinner ~ home by 9 p.m. ~ yes, me home by 9!!!!!!!! Scary!! I'll post a bit more about our holidays ~ and about the hooking my little grandpeople did ~ and then it's back to reality! Hope you all had wonderful holidays and are looking forward to a fantastic 2010!! I'm looking forward to a better year for our building business ~ it's starting out on a much more positive note than last year! And I'm looking forward to a year of good health and happiness and as much fun as we can squeeze out of this life! I wish the same for you!